GSK990MC milling and drilling CNC system is an upgraded product of GSK990MA, with 8.4 inch high resolution color LCD display and brand new interface, supports macro B(statement style), open PLC supports online editing and compile, which makes logic control more easier and flexible, GSK990MC is suitable for milling machine, drilling machine or even grinding machines. 1) Maximum positioning speed 60mm/min, support metric/imperial programming, the minimum command unit is 0.001 mm or 0.0001 inch. 2) With rotation, scaling, polar coordinates, fixed cycle, rigid tapping and other slot milling complex circulation. 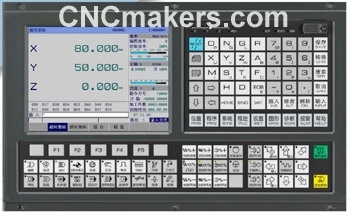 3) Adding machining time limit function. 4) Support PLC on line monitoring, editing, compiling and signal tracing. 5) Support Macro B(statement style). 6) More help information with tips, easier for learning, using and trouble shooting. 7) Standard RS232 and USB for file transfer, DNC and USB online machining. 8) 8.4 inch high resolution color LCD, supports Chinese/English/Russian/Spanish/Turkish. 9) GSK-link Ethernet bus function, supports 17 digit absolute encoder, with high accuracy and no need to return zero, which realize full-close-loop control(Optional). * Subroutine call , the user macro call . * Drive unit : GE2000, GS2000 series of digital AC servo unit , etc.